Dental implants are the most technologically advanced form of dental implant surgery available today. In early days before titanium was discovered, ancient civilizations made use of the materials they had available with them to replace lost tooth/teeth. This article gives a brief insight into some of the events which have led to today’s modern day tooth implants. The first case of tooth implantation was recorded in 1931. During excavation of ancient Mayan burial sites in Honduras, archaeologists found a Mayan mandible dating back to 600 AD. Careful study revealed that the mandible belonged to a young woman in her twenties. This mandible remarkably had three teeth shaped pieces of shell placed into the sockets of three missing teeth in the lower part of the jaw. Initially specialists thought that these teeth were placed into the mandible after the death of the subject as a custom in a similar way to the rituals observed by the ancient Egyptians. However, in 1970, Professor Bobbio, a scientist conducted another examination of the mandible. He discovered a compacted bone formation around two of the shell implants which made him believe that these tooth shaped shells had actually been implanted during the lifetime of the young girl. 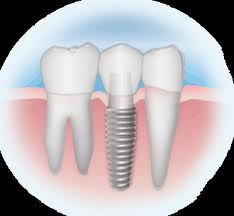 The modern dentistry uses Titanium for dental implant. However, how did the use of this material come about? First uses of Titanium in dental implants carried out at Cambridge University. Research scientists at the university discovered a way to create a titanium chamber which could be embedded into the ears of rabbits to study in vivo blood flow. A little while later P. I. Branemark, known as ‘the father of dental implants’ implemented the same method for use in the Rabbit Femur for studies on bone regeneration and healing. When he came to remove the chambers he found that it was impossible for him to do so – the bone had actually adhered to the titanium. Branemark coined this term ‘osseointegration’. In 1965 Branemark placed the first titanium dental implant into a human volunteer. In 1969 the first US patent for titanium dental implants was filed based on independent research. Over the next 14 years Branemark continued his research before joining into a commercial partnership with a defense company then called Bofors AB. In 1981 Nobel Biocare was founded and to this date they have placed over 7 million Branemark system implants. In addition there are now several other producers of dental implants including Paragon, Bicon and AstraTech. Thanks to the work of Branemark dental implants are now easier and within the reach of common man.